users who already jailbroken their devices with TaiG break Tool V2.0.0, no need to jailbreak again only need update TaiG 8.1.3-8.4 Untether by TaiG source “apt.taig.com” or “apt.3kzhushou.com”. * If there is a warning of “Storage Almost Full”-> run Cydia. * If jailbreak failed then turn off WIFI and try again. If failed again, please use TaiG Pro to restore and try to jailbreak again. 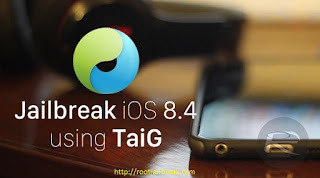 * TaiG Jailbreak 2.2.1 supports iOS 8.1.3 to iOS 8.4 untethered jailbreak. * TaiG break 2.3.0 support iOS 8.12 to iOS 8.4 (all versions between) untethered jailbreak.